US Cellular notifies me whenever Prism accesses my account. If you've recently added and synced your U.S. Cellular account in Prism, you may start receiving security notifications from U.S. Cellular, either by text or email, every day or so. Don't worry, this is normal! 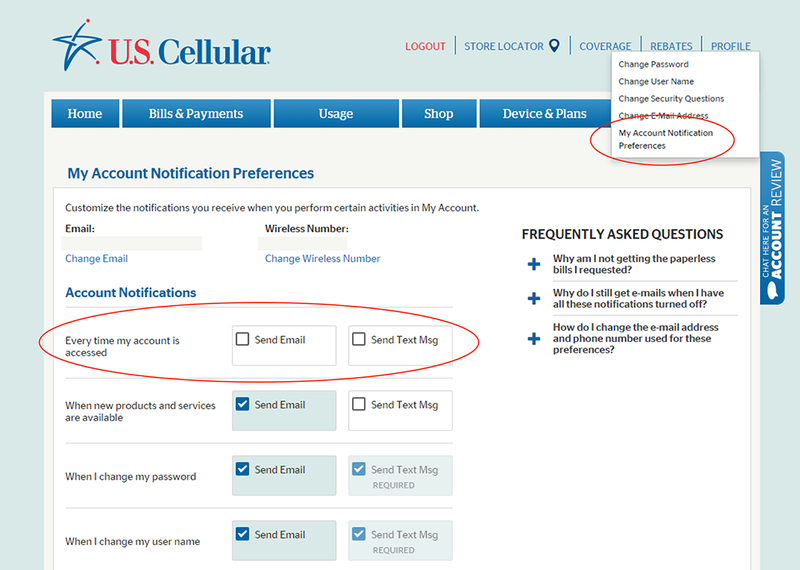 Some users have set their account to receive a text or email notification whenever their U.S. Cellular account is accessed. When Prism accesses your account every other day or so, this will cause this security notification to be sent to you. If you would prefer not to receive this notification every time Prism accesses your account, simply log into U.S. Cellular outside of Prism. Then click "Profile" in the top right corner, and then "My Account Notification Preferences" in the drop down. You will now see a list of various notifications. Simply uncheck both "Send Text Msg" and "Send Email" next to "Every time my account is accessed." That's it - you shouldn't receive these notifications any longer!